How can a museum span six towns across the state? When I say it can. 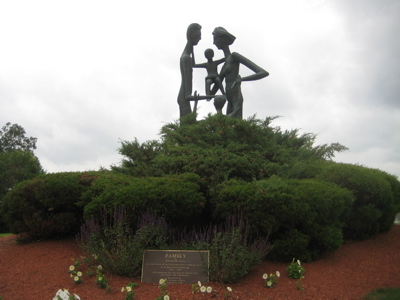 UConn has a terribly unpublicized collection of top notch public art at several of its campuses, as well as the law school and health center. 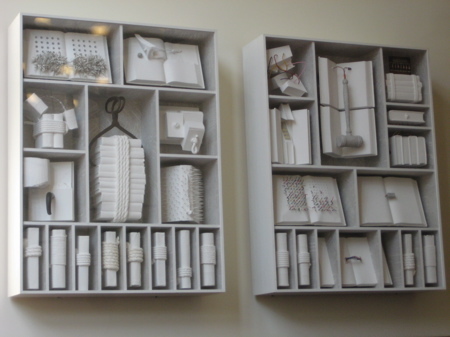 I picked up a handsome little booklet called “Keepsake” at the William Benton Museum of Art in Storrs (CTMQ Visit here) and was immediately drawn to the challenge of witnessing all 30 installations. There is nothing online about this collection at all, other than the page you are reading. And this page was created in 2009. For now, a work in progress… Presented in the order and the manner (by artist’s last name) of the booklet. I have no idea how many of these will be around when I get around to them (Torrington’s campus has since closed, for example), so bear with me. Fritz Bultman was a student at Hoffman’s School in Provincetown, MA and the New Bauhaus in Chicago. Bultman taught at Pratt Institute, Hunter College and at the Fine Arts Center in Provincetown. Sol LeWitt earned his BFA from Syracuse University in 1949. he worked for architect I.M. Pei. 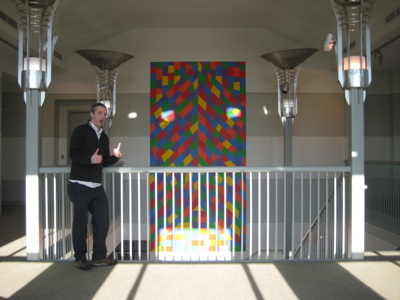 LeWitt is regarded among the leaders and proponents of Minimalism, while he popularized the term “Conceptualism.” He has been honored with numerous international retrospectives. I really liked this one. 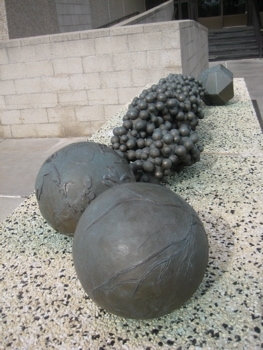 Jim Sanborn is noted for his work with American stone materials that evoke mystery and nature. He received his MFA in sculpture from Pratt Institute, and since has had work exhibited nationally. But check this out – Sanborn’s father was the head of exhibitions at the Library of Congress, and his mother was a concert pianist and photo researcher. 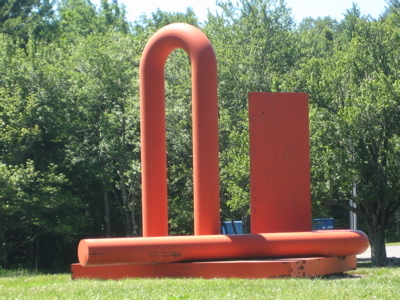 Sanborn created one of the most interesting and popular public art works in US history. 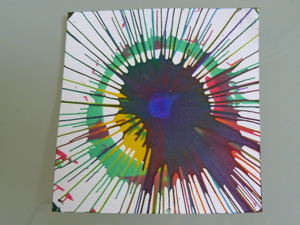 (Not this one, though it is similar in nature). 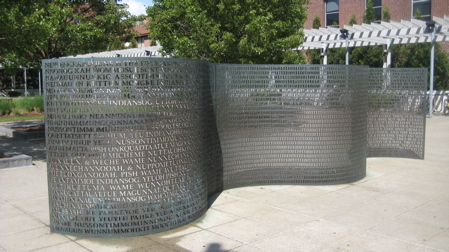 Kryptos is a sculpture located on the grounds of the Central Intelligence Agency (CIA) in Langley, Virginia. Since its dedication on November 3, 1990, there has been much speculation about the meaning of the encrypted messages it bears. Of the four sections, three have been solved, with the fourth remaining one of the most famous unsolved codes in the world. The sculpture continues to provide a diversion for some employees of the CIA and other cryptanalysts attempting to decrypt the messages. Here are bunch more of his works, some very similar in nature. Alexander Liberman was a Russian-American artist. His highly recognizable sculptures are assembled from industrial objects and often painted in uniform bright colors. his work is found in many prestigious collections. More prestigious than sitting in front of the 3 building “campus” of UConn’s Torrington Campus? I doubt that. I probably visited the sculpture on one of the 18 days of the year there’s no snow around up here. My word, this place is off the beaten path. But no matter, the bright red sculpture is striking and a welcome addition to the rather pedestrian buildings of the school. Wopo Holup received her BFA from San Francisco Art Institute, and her MFA from Mills College. 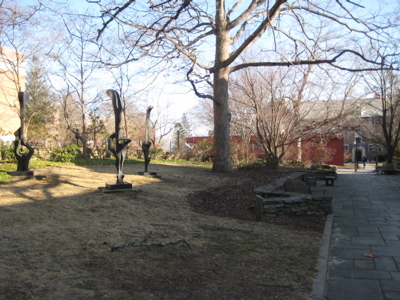 She has exhibited works since 1977, many of which are public commissions on display across New England. I dug this one. First of all, these things are nearly impossible to find as the “Front Entrance” is fairly inaccessible. 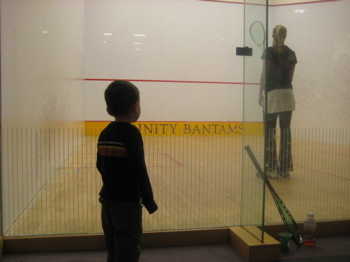 Also, they are the size of softballs – and the brochure led me to believe they were rather large. They really are a bit small for the outdoor space, but I still liked it. Wolfgang Behl was born in Germany and studied art at the Rhode Island School of Design. Behl taught at the Hartford Art School for much of his life. 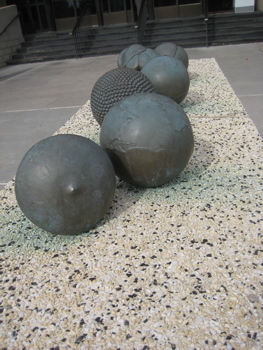 An overview of his work was exhibited at the Sculpture Center in NYC in 1980. First of all, the Law Library is beautiful. 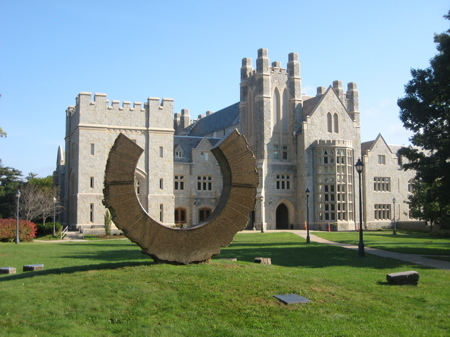 It is a newer building, but was built to match the classic gothic buildings of the rest of the campus. It is well-lit and airy, which goes against gothic ethics, but it’s really very nice. I walked all over the dang place looking for this piece, and finally found it as I was giving up and leaving; it’s immediately to the right of the main entrance. Werner Pfeiffer is a multifaceted artist born in Germany. He was a professor at Pratt Institute. His works of art have been shown internationally in over 200 shows. While the symbolism of this piece is a bit trite (law books bound by rope, studded with spikes, criss-crossed with a gavel and a stethoscope, etc. ), it’s still pretty cool. It also fits very well not only in a law library, but also the blaring white on a white wall next to a massive 3 story window really works. Robert Sindorf studied at Columbia University. He describes his style as minimalist and abstract. Sindorf’s work is designed as site-specific, with emphasis given to scale, color, mass, orientation and unity with the setting. Like I said, it works here. I can’t tell you what it “means,” but it looks cool. 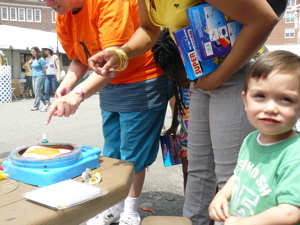 Love that squashed bug picture!